Heavyweight rider Lee Pearce of the Northwest region and his 14-year-old gelding Fire Mt Malabar hit an impressive milestone at the Owyhee Tough Sucker II endurance ride near Oreana, Idaho on April 27 2013. 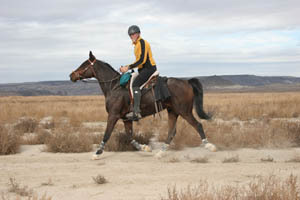 After finishing in 6th place in the 50 mile ride in 5:47.01 beside his wife Naomi Preston, Lee and Malabar received the Best Condition award, the 30th BC that the duo has won over Malabar's 7-year endurance career. This puts Fire Mt Malabar in an 8th place tie for all-time Best Condition awards in the AERC. The pair also won the National Best Condition award of 2011. Fire Mt Malabar is a son of the redoubtable 7000+ mile, 1992 AERC Hall of Fame horse Sierra Fadwah +/, out of Malabar Dawn by Malabar Amir. Malabar has 3820 miles with a record of 65 completions in 68 starts, with 6 100-mile completions, while Lee has over 5600 miles. Lee and Malabar are just the epitome of an impressive team. Consistency like this reflects such good horsemanship and care. Congratulations to them both.